Middlesbrough AC (Mandale) were represented by three outstanding junior athletes at British Universities Championships at the weekend and one overseas last weekend. Representing their various Universities the star attraction of the weekend and the most outstanding performance came from none other than Charlie Myers in the pole vault. In great form over the last few weeks including a lifetime best of 5.32 metres at last weekend’s British senior Championships Charlie was hopeful of exceeding this at this weekend’s Championships. Representing Northumbria University Charlie entered the competition at a height of 5.10 needing three clearances at that height and 5.20 metres before finding his rhythm. A first time clearance at 5.30 metres put him in pole position before going on to clear a winning height of 5.40 metres which was a new personal best, a new club record and also puts him second in the UK under 23 ranking s for 2017. After the competition Charlie said “I was happy with the result but the performance could have been better, I’m looking for 5:45 before the outdoor season starts which is the European u23 standard and World University Games qualifier before trying for 5:50 outdoors which is the Commonwealth Games Standard”. Elsewhere in the competition Sam Day (Cambridge University) finished fourth in his 400 metre semi-final in 50.93 seconds and Sam Griffin (University of Teesside finished third in his semi-final in the 200 metres in a seasons best 22.37 seconds. In Nashville Tennessee Middlesbrough AC’s Hannah Segrave was in the form of her life at the Music City Challenge meeting. Representing Milligan College Hannah finished in second place to British senior International Marilyn Okoro over 800 metres to break her own club record with a time of 2 minutes 3.80 seconds. This time puts Hannah in first place in the UK u23 rankings and the time is also narrowly outside the qualifying time of 2.03.00 needed for the European under 23 Championships in July. The 2017 North East Indoor Athletics Championships produced some stunning performances from Teesside athletes winning a total of 23 medals including 6 gold and setting 2 championship bests. The outstanding race of the championships from a Teesside point of view came in the under 17 women’s 60 metre hurdles between Jasmine Clark (Middlesbrough AC) and Amy Carter (New Marske Harriers). Clark and Carter have both been in great form this winter with Clark taking silver in the Scottish Championships with a personal best of 8.89 seconds and Carter the silver at the Northern Championships with a personal best of 9.07 seconds. With both Amy and Jasmine taking their heats with ease a good final was on the cards and the two girls did not disappoint. Following a fast start by Jasmine, Amy hung on and just edged ahead coming off the last barrier to take the Gold medal. Both girls were given the same time of 8.84 seconds which were personal bests for each of them and a championship best performance. The times rank the girls who are both supported by local charity Fastfund equal 5th in the UK rankings, going into next week’s national championships at Sheffield. Jasmine and Amy then returned in the 60 metre flat race and were again in the medals. Jasmine winning silver with a time of 8.03 seconds and Amy bronze with 8.09 seconds. The second championship best came from Grace McDonald (Middlesbrough AC) in the under 13 girls shot putt. Grace improved on the previous best by almost a meter with a throw of 9.09 metres. That new personal best and club record moves Grace into fifth place in the UK rankings for 2017. Steven Wheater and Ethan Rigg (Middlesbrough AC) took gold and silver in the under 17 men’s high jump. Steven added the North East title to the Northern title he won last month with a clearance at 1.90 metres. His training partner Ethan claimed the silver medal with a good clearance at 1.80 metres. Ethan then returned later in the day to add long jump bronze to his collection with a distance of 5.98 metres. Matthew Brining (New Marske Harriers) was in great form in the under 17 men’s pole vault winning the title with a height of 3.80 metres before an injury forced him to withdraw. His club mate Molly Thrower showed she is one to watch winning long jump gold in the u 13 girls age group and also taking silver in the 60 metre hurdles. Middlesbrough AC duo Kate Carmichael and Beth Carter took gold and silver in the under 20 women’s shot put Kate winning with 9.83 metres and Beth throwing 9.49 metres. There was further silver wear for Afoma Ofor (Middlesbrough AC) in the under 15 girls 60 metres with a new personal best of 8.11 seconds, following a personal best of 8.10 seconds in the semi-final. Alex Neeve (Middlesbrough AC) made and exciting debut for the club taking bronze in the senior men’s 60 metres in 7.34 seconds. Melvin Taha (Middlesbrough AC) also took bronze in the 60 metres, this time in the under 20 age group with a personal best of 7.20 seconds. In the jumping events there were further bronze medals for Matthew Walker (New Marske Harriers) in the under 15 boys high jump, Dan Brazukas (Middlesbrough AC) in the under 17 men’s triple jump. In the throws events there were bronze medals for Catherine Burns (Middlesbrough AC) in the under 17 women’s shot with 9.57 metres and Kailin Enderwick (Middlesbrough AC) in the senior women’s shot putt with a distance of 10.26 metres. Congratulations also to Jasmin Clark, at the Emirates Arena in Glasgow, Jasmin won a Silver medal in the 60M Hurdles and set a new PB of 8.89 putting her Second in the club records. 07.02.16 Congratulations to Charlie Myers on his Silver medal at the England under 20 championships in Sheffield. The Sheffield Festival of Athletics meeting at the English Institute of Sport attracted some top quality fields and Middlesbrough AC athletes put in some top performances. Sam Day was in fine form once again in the under 20 men’s 400 metres, taking the gold medal in a fast 49.82 seconds. Nick McLeod bounced back to his best form running a huge personal best of 51.44 seconds in his senior men’s 400m heat and the promising 16 year old Tom Weston ran indoor personal best of 52.26 seconds to win the under 17 men’s race. Myles Murray took over a second from his personal best over 400 metres to record a time of 58.23 seconds. In the under 17 ladies 400 metres Ella Maxwell broke 60 seconds for the first time with a winning time of 59.41 seconds in her race. Competing in the under 20 women’s shot put Beth Carter was in great shape winning gold with a personal best of 9.96 metres. In the 200 metres Sam Griffin finished third in his heat in 22.77 seconds. The club athletes that entered on the first day of competition saw them all come away on podium finishes; Long Jump Senior Men Jack Roach 1st 7.04, U20 Shot Putt Men Aaron Jeal 2nd 11.26, Shot Putt U20 Woman Kaitlin Enderwick 2nd 9.66, U17 Woman Shot Putt Kate Carmichael 3rd 11.02, U15 Woman Shot Putt Catherine Burns 3rd 8.95. Picking up a trio of medals in his 3 events U15 Men Daniel Brazukas 3rd 4.12, Triple Jump 3rd 8.95, High Jump 2nd 1.40. Club athletes competing were 60m U13 Girls Charlotte Kelsey 5th 9.07, 60m U15 Men 5th Hedley Wordsworth 7.83, U15 Woman Tamara Miller 3rd 8.28, 60m U17 Men Nathan Alford 6th 7.74, 60m U20 Men 4th George Dawson 7.43. World and European 60 metre Champion Richard Kilty (Middlesbrough AC potential member) began the preparations for the defence of his World Indoor title in March this year with a confidence boosting run at the Scottish Senior Indoor Championships at the Emirates Arena in Glasgow. Following a comfortable heat win in 6.97 seconds Kilty returned to win his semi-final in a slightly faster time of 6.79 seconds. Going into the final he again upped the tempo with a fine run taking the gold medal in a new club record of 6.65 seconds. Kilty will be running at the British Indoor Championships at Sheffield at the end of February with the aim of qualifying for the team that will travel to Oregon USA in March for the World Championships. The 2016 Northern Indoor athletics Championships were held at Sheffield’s English Institute of Sport at the weekend. Athletes representing Middlesbrough AC acquitted themselves well in the track and field events. Winning a trio of silver medals. Club record holder Charlie Myers competed in the under 20 men’s pole vault competition. Myers claimed the silver medal with an impressive clearance at 5.10 metres. Sam Day broke 50 seconds for the first time in his career in the under 20 men’s 400 metres winning his silver medal in a time of 49.38 seconds less than two tenths of a second from Jack Crosby’s indoor record. The final silver medal came from 21 year Jack Roach. Roach was only one centimetre shy of his lifetime best in the senior men’s long jump taking silver with a leap of 7.25 metres to move into second place on the clubs all time rankings behind Chris Tomlinson. 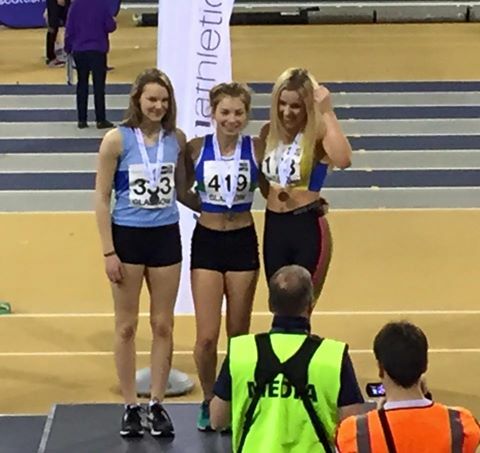 Ella Maxwell and Libby Hedger ran well to reach the finals of the under 17 women’s 300 and 800 metres respectively. Maxwell finished in fourth place in the 300 metres following a personal best of 41.57 seconds in her semi-final. Hedger was a brave sixth in the 800 metres in 2 minutes 24.73 seconds. The Northern Athletics senior championships take place at Sheffield’s English Institute of Sport next weekend with athletes representing Middlesbrough AC hoping to show medal winning form. Leading the title challenge will be club second claim member and British Indoor long jump record holder Chis Tomlinson. Tomlinson (Personal best indoors 8.17 metres) is entered for next Sunday’s senior men’s long jump competition. Since recovering from a slight break in his right arm in early December Tomlinson who has been training well, will be hoping for a confidence boosting performance ahead of the British Indoor Championships to be held at the same venue in February. Joining Chris in the long jump will be Jack Roach who will be hoping for a medal winning performance and an improvement on his personal best of 7.26 metres. Currently studying for his master’s degree at Loughborough sprinter Ben Stephenson competes in the men’s 60 metres. Ben will be hoping to improve on his silver medal winning performance of 12 months ago and his personal best of 6.87 seconds. Nick McLeod will be running in the 400 metres and 800 metres and in good form following two recent wins at Sheffield Nick will be aiming to improve on his personal bests in both events. In the under 20 men’s events Charlie Myers makes his season’s debut in the Pole Vault. The European Junior sixth placer from 2015 will be targeting a vault of over 5 metres 30 to attain the qualifying height for this years World Junior Championships to be held in Bydgoszcz Poland in July. Previously a 400 metre runner Sam Day makes his indoor debut at 800 metres at these Championships and will be looking to make the final and run under two minutes for the first time. The under 17 women’s events see’s the largest group of athletes from the club. In the middles distance events Libby Hedger makes her indoor debut in the women’s 800 metres and probably her best chance of a medal will come in the 1500 metres on Saturday. Jasmine Clarke goes in the 60 hurdles, and she also competes in the 300 metres alongside Ella Maxwell, Kathryn Page and Ellie Hewittt. Ella has been In good form indoors over recent weeks having set two personal best over 60 metres. Ella and Kathryn also compete in the 200 metres on the Sunday. Ellie also goes in the 60m. The North East Indoor Athletics Championships took place at Gateshead College at the weekend with field events taking place on the Saturday and track events on the Sunday. Pride of place on the Saturday went to 16 year old Beth Carter, Carter Middlesbrough AC (Mandale) was defending the title she first won in 2014. With her very first throw of the competition Carter smashed the championship best of 10.49 metres with a new personal best of 11.51 metres. Her new best performance was good enough to move the talented teenager to seventh place in the UK rankings just two weeks before the national championships. Two other gold medals on the first day went to Beth’s training partners Rob Longstaff (Midd AC) and Jess Welburn (Midd AC). Both athletes defied the lack of proper preparation due the facilities at Middlesbrough Sports Village not yet being ready, to take Gold in the senior men’s and under 20 women’s triple jump respectively. Adam Cowperthwaite (Midd AC) was in the best form of his young life to finish fourth in the under 15 boys high jump with a personal best of 1.45 metres to finish in fourth place. Catherine Burns (Midd AC) threw well in her first year in the under 15 girls age group finishing fourth in the shot put and Jasmine Clark (Midd AC) was fifth in the under 15 long jump with a best of 4.36 metres. In the under 13 boys age category Robert Ward (Middlesbrough AC) claimed the silver medal in the 60 metres. George Dawson (Middlesbrough AC) showed that he is wintering well winning the Bronze medal in the under 17 men’s 60 metres in a personal best of 7.41 seconds, the same time as the Silver medallist. in the under 20 women’s 60 metres Jess Welburn (Middlesbrough AC) finished in fourth place in a time of 8.20 seconds. There were two further Bronze medals for Middlesbrough AC. The first from Jasmine Clark in the under 15 girl’s 60m hurdles and the second from Adam Cowperthwaite in the under 15 boys hurdles. The next major competition for local athletes will be the National under 20, under 17 and under 15 championships at Sheffield the weekend of the 28 th February/ 1 st of March. The next regional competition will be the North East combined events championships on the 22 nd of March at Gateshead.